Adulticides,Barrier Spray Treatments and Lavacides are the three best known practices to achieve mosquito control. Lets go over each one in more depth. Do you know witch one is right for you? Adulticides are the most common ways your County will treat for mosquito populations that may be carrying a virus. You have more then likely seen them spraying what appears to be a white cloud of mist floating away from there vehicle. The pesticides that are being applied by a misting gun are only short lived in the environment. When the mist cloud stops drifting and lands the effectiveness is gone. Adulticides that are sprayed in this manner are targeting the adult mosquitoes in flight. This application is usually done in and near wet or swampy areas during dawn and dusk of each day. This application even though its very effective does very little in helping you in your quest to be mosquito free in your back yard. 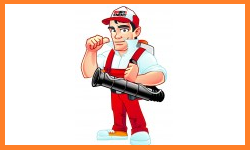 Barrier Spray Treatments can be either all-natural or pesticides. 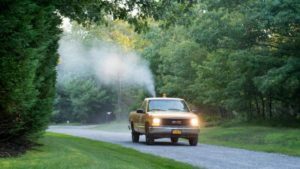 The pesticides are more effective in eradicating adult mosquitoes then the all natural choices. The all-naturals need to be reapplied sooner then the pesticides, as they are not as stable in the environment and effectiveness is lost much sooner, both are effective in reducing the mosquito population by large numbers. Witch one you may choose depends upon what your trying to achieve with known effectiveness and costs between the two choices. Lavacides are pesticides that will attack and kill the first three stages of the mosquitoes life cycle before they become adults, there are many products and different ways to achieve these results. 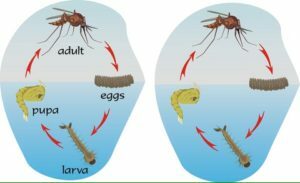 If you can control the first three stages of the mosquitoes life cycle the effectiveness of the barrier sprays are much more effective achieving your goal of being mosquito free.